Wow! It’s been a while since I’ve posted – but the babies, the holidays and everything else have totally taken over!!! In the next few days I’m going to post some resources for Navidad as – IT’S ONLY 3 WEEKS AWAY!!! AHHHHHH!!!! As part of my family unit I like to discuss family traditions and celebrations- and how perfect that this unit always falls in December! I start my celebrations unit off by having the students fill out a KWL chart about what they think they know and want to know about holidays in the Spanish-speaking world. I came across this great video from http://www.bablingua.com- it’s called ¡Feliz Navidad! and covers the basics on holiday time in Spain. It’s not free 😦 but it does come with a pretty great packet, audio files and a video for $8.00. I highly recommend it, so it’s totally worth the $$$. The video covers Christmas Eve, Christmas Day, “El Día de los Inocentes” (the Spanish version of April Fool’s Day), New Year’s, Christmas songs and typical foods. I usually do the video in chunks and then do the follow up activities from the packet and I also have the students make connections with their own celebrations. The video also talks about the big Christmas lottery they do in Spain. Every year they come out with these great commercials promoting the lottery. Here are some of the videos I found on YouTube from this year and previous years. Do you do a unit on holidays? What resources do you use? For those of you getting ready for El día de los muertos, here’s a project I do with my 1B’s. If you search el día de los muertos on my blog, you’ll find even more resources. Hope you find it useful! When I teach cultural topics I like for the students to create something from the target culture or from their experience in lessons, that way it wasn’t just a “cultural Friday” type of activity. 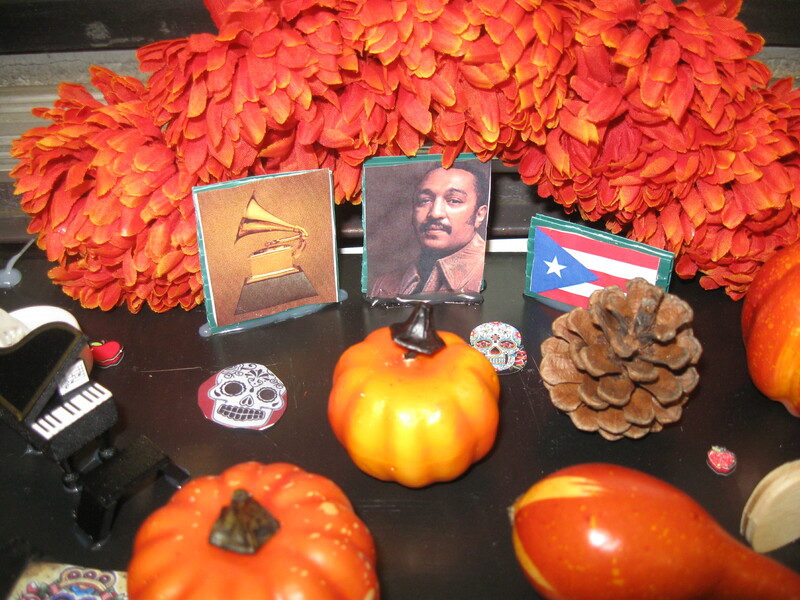 For el día de los muertos, I have the students create altars or ofrendas in honor of a deceased Hispanic celebrity. 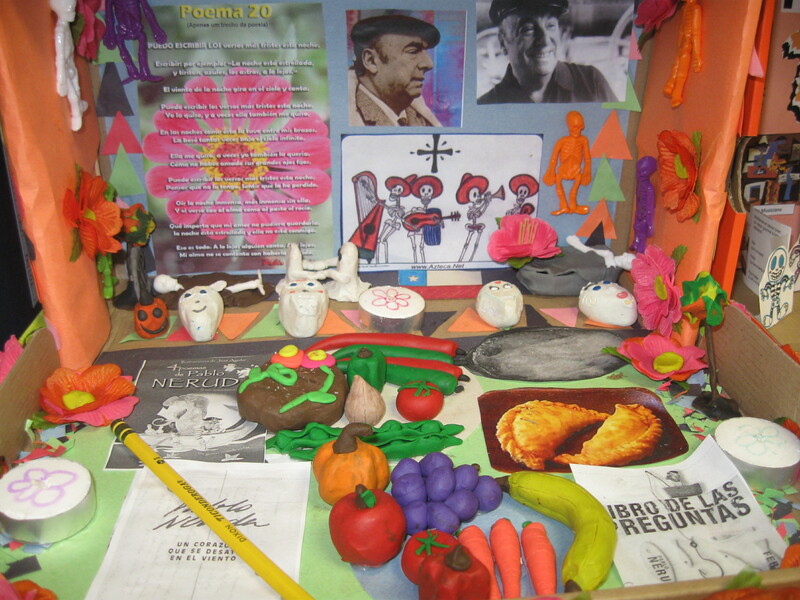 It’s great because not only do the students learn about a famous Hispanic they get to experience hands on (to some extent) the process that goes into making an ofrenda for someone who has passed away. The first thing I have them do is research a deceased Hispanic celebrity. Students get a person from a list I have created at random. They then research where the person was from, about their life and why they were famous. After learning about el día de los muertos, I then present the project to them. 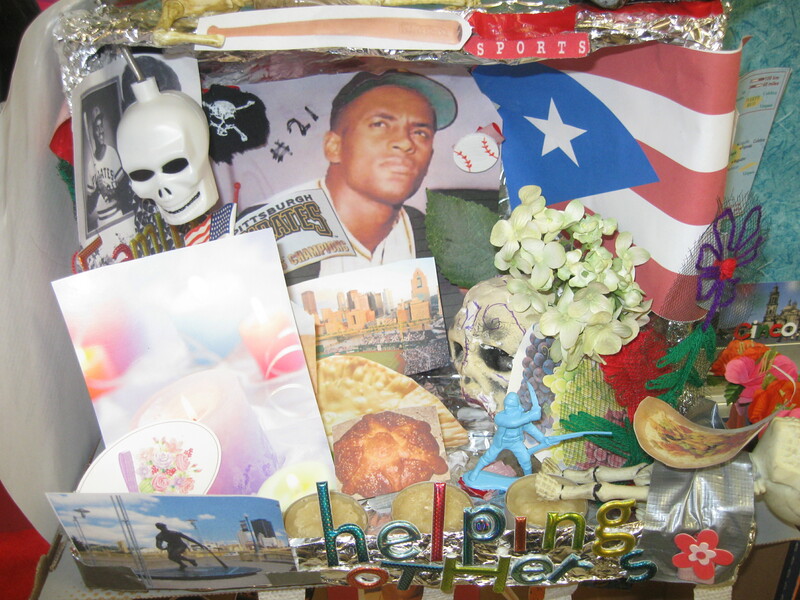 I show them images of the shoebox ofrendas previous classes have made and explain to them that they will create an ofrenda for the person they studied. 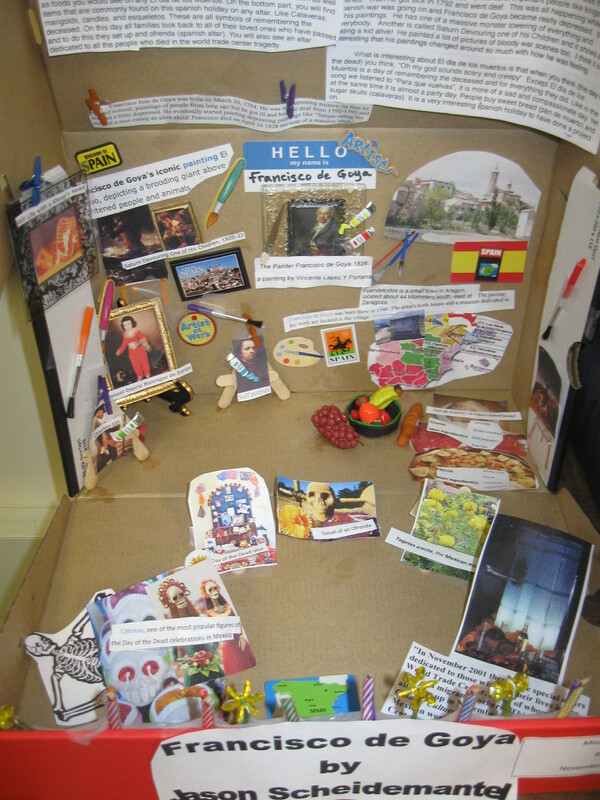 Their task is to not only create an ofrenda, but create it in honor of that person- thinking about what items they can place on the altars that really represent their person of study. Here are some examples! What do they need to make the ofrendas? They need a shoebox and some creativity! Some students buy little scrapbooking stickers, use clay, toys, and images to use on their altar. The flowers they use are usually from a craft store and they some how find battery powered candles to put there too (since I won’t allow the real thing). The final product is what you see in the slideshow, plus they do a small write up of who their person was and why they put what they put on their altar. Here is my TPT for this project. 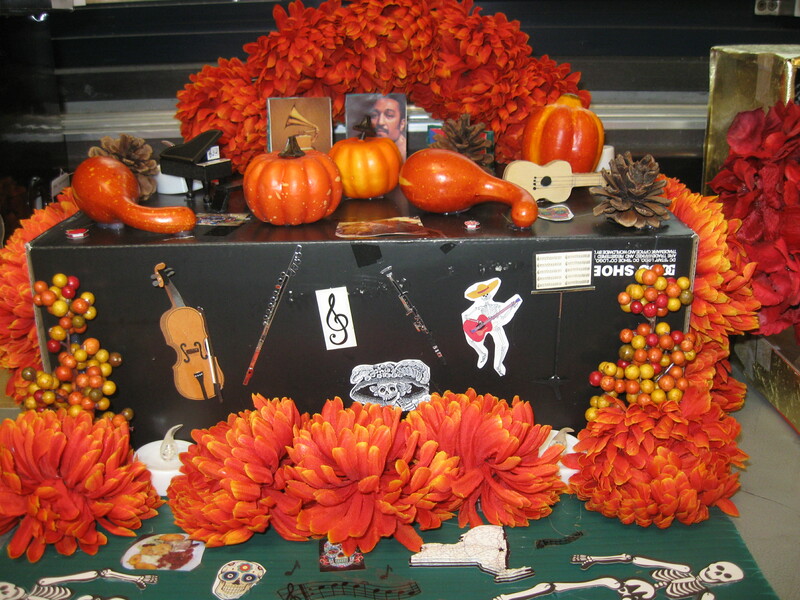 Do you do something special to celebrate el día de los muertos? El día de los muertos is in just a few short weeks! I do this mini-unit with my 1B’s and they love it because they get to do so many neat activities. To get things started I created a webquest for the students to do online. The site I use for the quest is great since it gives a great overview of the holiday, has some videos and great images. I then plan on reviewing the quest with them and showing them a few videos to prompt discussion about what this day is really like and how it is NOT like Halloween. Here are some of the videos I use. These are in English, but I teach level one and finding cultural videos in Spanish they can comprehend at their level is hard to do. I looked for it on youtube and found it! It’s called Ofrendas, by Pedro Guerra. The video is amazing as it has so many visuals you can discuss with your students in the Target Language. Another activity I do is an A/B cultural information gap activity. Similar to what you might use to practice vocabulary, but with culture. Here it is. 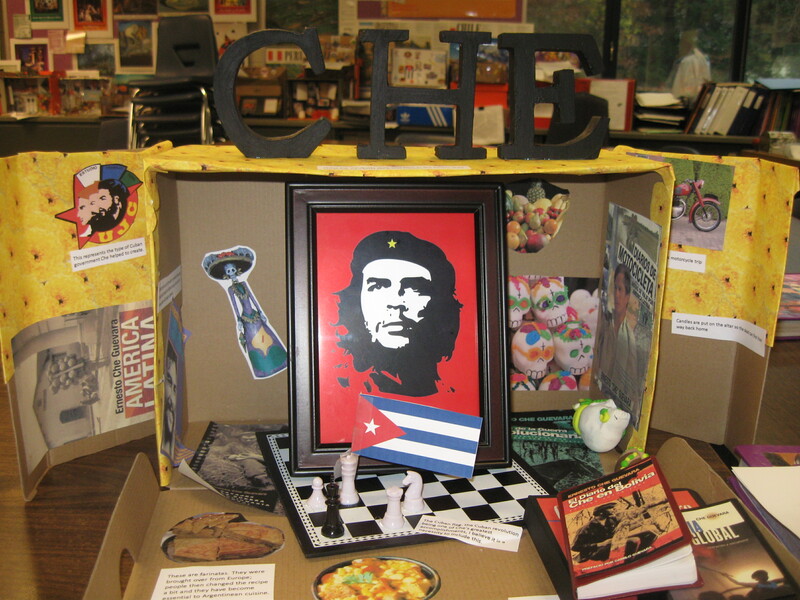 I also do this ofrenda project each year! The students love it! What resources do you use to teach the Day of the Dead? Do you have any good videos in Spanish? What did I do without Pinterest before it existed??? I found this great visual to spark a conversation about El Pan de Muerto and the celebration of el Día de Los Muertos. I didn’t make a handout for it as I think its a great warm-up and we do those digitally. 1. ¿Te gusta el pan? 2. ¿El pan que tú comes tiene alguna forma? 3. 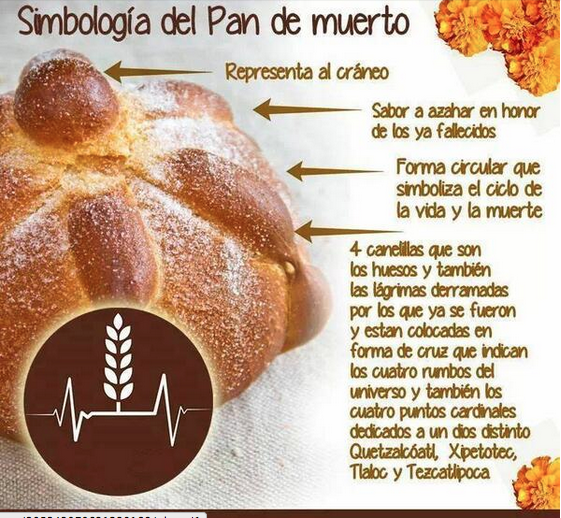 ¿Qué significa la forma circular del pan de muertos? 4. ¿Qué significa la cruz de lágrimas? Have you taught the Day of the Dead? What resources do you use? I’d love to actually make the bread with the students but we are no longer allowed to have food in the classroom 😦 This has been difficult because breaking bread with our students was a great way to spark cultural conversations. Is this a policy at your school? How have you dealt with it? I love teaching this unit! There are SO many authentic resources out there and of course – who doesn’t like talking about food??!! For this unit I really wanted the authentic resources to be the main point of my lessons so I designed several online activities that have students look at and interpret authentic menus and websites from restaurants – mostly restaurants from Colombia because those are the ones I’m familiar with. Sopas de mamá y Postres de la abuela is an authentic restaurant with many establishments throughout the country. Their website is AWESOME and a great springboard for so many different activities. I created this webquest that has students interpret what they see on the site and on the menu. The menu is great because its chock full of authentic ingredients they may not be familiar with so it will lead to great discussion. It’s here on my TPT site if you’re interested. I also created a http://www.lingtlanguage.com activity too. If you have an account just search restaurants I (it’s free). If you aren’t a member yet – definitely consider becoming one because it’s an amazing resource! What restaurant activities do you do with your students? What other restaurants would you recommend exploring with students? My family and I are from Colombia so I can’t talk about holidays in December without talking about Colombia! Since I also talk about holiday time in Spain, it’s a great opportunity for students to compare their traditions. The students just love to watch all of these videos and see how people really celebrate the holidays and how they are different and in many ways similar. I begin my conversations about Colombian holidays with the following video and then have them talk about what they see and how it compares to holiday time here in the US. This next video was taken in San Cipriano in Valle del Cauca – I love it because it shows the Afro-Colombian community and although it is a bit hard for my novices to understand the video its okay because they get the visuals. After the video we also do comparisons and talk about what they do that is similar or different. 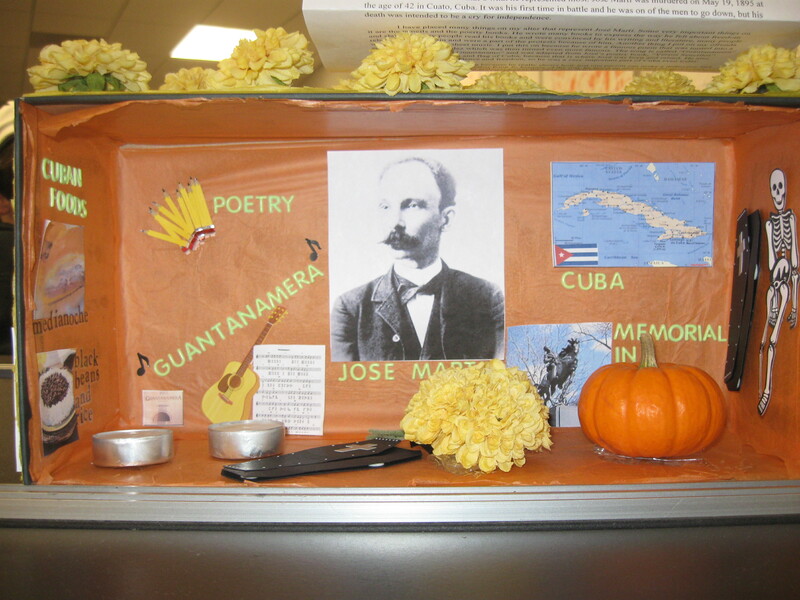 Last year I came across this video and not only did we watch it in class- but we made our own año viejo! It was so much fun! Of course we didn’t burn it but the process was a lot of fun. I put the class in two groups and had them bring in old clothes, shoes and newspaper. The day of the activity the groups competed to see who could make their año viejo the fastest. Afterwards, we had a countdown and ate 12 grapes when the clock struck “12:00”! We even made wishes for the new year and each student shared in Spanish what they hoped for in 2012. How do you celebrate el Año nuevo with your students? Currently, my 1A’s are learning about leisure time activities. One of the things I like to discuss with them are pastimes in the Spanish-speaking world and how music and dance play a big role in many of the activities we do in the Spanish-speaking world. Every year I do a unit on music and dance and it’s always a lot of fun because the students get to listen to music and dance! Here are some online activities I have created using the above sites- I posted them to teacherspayteachers since they did take me a very long time to create- sorry! Do you have any resources you use to teach music and dance? A few years ago Bibi Deacon (an old colleague and dear friend) and I presented a workshop about Colombia at MaFla. It was titled- Conoce la magia de Colombia. It was a workshop all about Colombia and its culture. I love teaching about Colombia, not only because that is where I am from but because unfortunately, Colombia has a bad rap- and as an educator I feel it is my duty to dispel any and all stereotypes against Colombia.